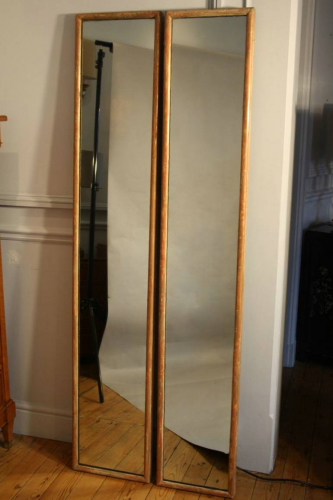 A pair of tall narrow mirrors - the frames are aged so there are patches of gilt here and there. Please note one tall mirror is 0.5cm smaller in height and 2cm narrower - if placed apart the eye would notice the difference. Heavy and sturdy with very nice old but clean mirror glass. English c1920.